With a prowling Paul Hollywood casting a watchful eye over a batch of bakers keen to prove their bread-making abilities, Bread Week was never going to be a walk in the park. But despite being knocked back more than once over the course of the three challenges, and eventually being named the baker to leave the tent this week, Antony kept smiling throughout. What a guy. “Bread has never been my strongest baking strength. The first bread that I baked was only this January, so I am a relative newcomer to it. I went into that tent pretty nervous knowing this, so I was fully aware this could be the week that I was going to go. “Paul prowling around the tent made me stupidly nervous as he is the Bread King, so that wrecked my nerves. The stress of the tent changes you completely as a person. The judges were great and I really wanted to impress them both. “My best bit was in Biscuit Week when Paul said my Chilli Jam Goosnargh Cookie was a melt-in-the-mouth Regional Biscuit, and Prue came back for second helpings. My bond with all the other bakers was superb too, and we gelled from the start. More often than not it would be at the bar after a long day of filming — there was definitely a bit of unity at the bar! “The reaction has been wonderful at work. Lots of bankers who I didn’t think would be interested in baking have really got involved in the show. I have turned them from football-watchers into Bake Off watchers, so I am pretty chuffed with that. 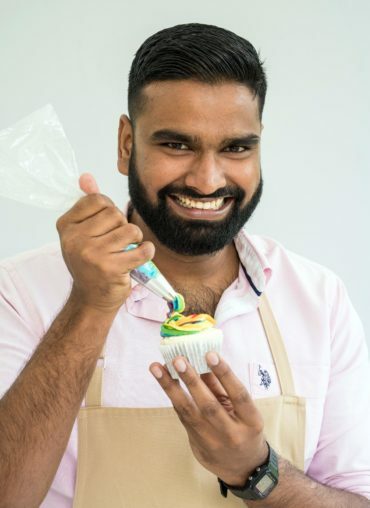 It’s unexpected to think that bankers make good bakers, but maybe because it’s something we do to relax and unwind at the end of a busy working day. To be at home in your own kitchen, where you don’t have the time constraints of the tent or Paul and Prue judging you, it’s stress-free and pure enjoyment! “Although I knew bread week might be my doomsday, I wouldn’t change the experience for the world. I was really sad to go as I knew it was the end of my baking in the tent with all the other bakers. To have met the most amazing bakers and made new best friends has been incredible for me. The whole team behind the programme helped make this an amazing three weeks of my life. 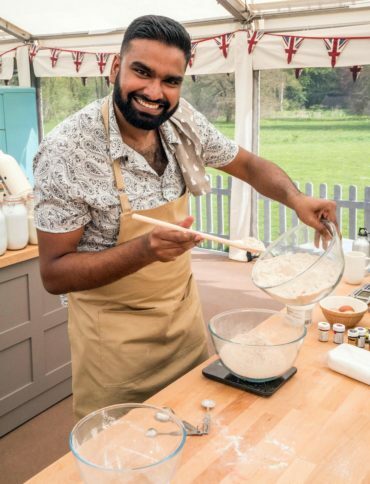 Antony will join Jo Brand on The Great British Bake Off: An Extra Slice on Friday 14th September at 8pm on Channel 4.